Join today - it’s FREE! 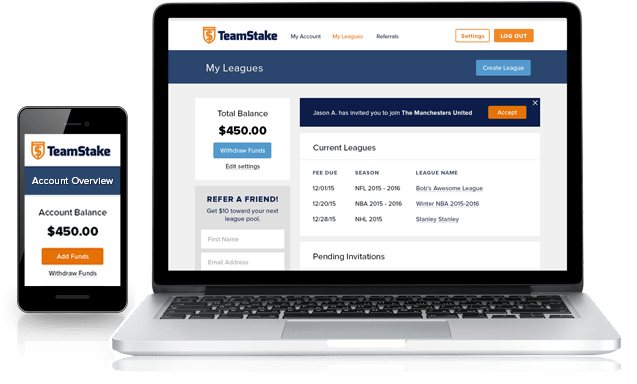 TeamStake provides fantasy sports leagues with a fully customizable payment collection and payout distribution system at absolutely no charge. Draft day should be spent mulling over cheat sheets and sleepers, not stalking league members and reminding them to pay or worrying that you won’t see your payout when you end up winning. Our fully customizable system allows the commissioner to set specific due dates for each league and automatically invites league members to pay the entry fee using multiple free methods. Effective reminder emails and optional late fees are also put in place so that your entire league is finally motivated to pay on time. Set due dates, establish late fees, and send reminder emails - all from one simple interface. You can stop worrying about not seeing your money again after you pay the league dues. All funds are stored in our TeamStake holding accounts, which leverage 256-bit AES encryption to guarantee that you will get your payouts at the end of the season. All league members can now work the waiver wire knowing that their payout is coming. Enjoy the season knowing that your league funds are safe and secure in our TeamStake holding account. Payout settings are completely customizable and allocations can be verified by league members. Winnings can be withdrawn immediately following the end of the season, so don’t worry about not getting your money in time for the next fantasy sports season. Choose how winners are verified and authorize payouts quickly and easily with just one click. TeamStake is completely free to use, does not take a percentage from any league’s pot, and will not charge any hidden fees upon payout. If your league collects $500 in entry fees, $500 will be paid out. The only fees charged are a 3% transaction fee for payments made by debit/credit card in order to offset card processor fees. All E-check and balance transfer payments are completely free. Take advantage of our free methods for paying and withdrawing league dues. Your fantasy league’s payout structure shouldn’t be limited by the software you use. TeamStake gives the commissioner the freedom to customize how many league members are being paid out, when payouts take place, how payouts are verified, and more. The money will be spread around however you see fit for every fantasy sports season. Easily change league size, payment deadlines, payout verification, payout timelines, and much more! TeamStake gives full measure to ensure that all transactions are secure. We automatically encrypt every member’s confidential information using industry-leading technology to keep transactions guarded from start to finish. Payment information isn’t stored and other league members will never have access to your bank account or credit card information. We guarantee the professional safekeeping of your funds through full-featured security measures. 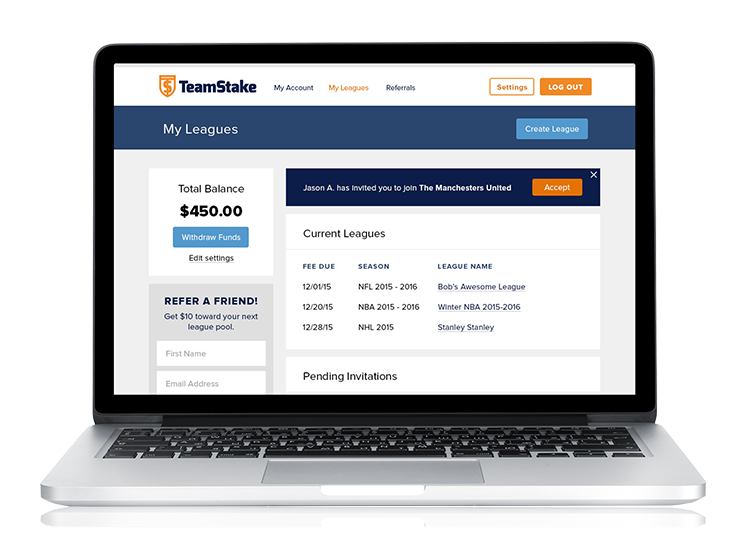 TeamStake ensures that entry fees for all your leagues are easily managed from one robust interface. Message participants, set deadlines, and much more!